I’ve been an instructor and a coach in agility for more than 25 years. Writing a lesson plan is an art form, I suppose, intended in the main to elevate the keenness of handling and raise the training objectives with an individual dog. The NDAL 60×90 Masters course was of my own design. I’m happy to report that October will be designed by Stuart Mah, author of Course Design for Dog Agility, a foundation reference in our sport. I would like to share with you some of the intended exercises for my own handler classes that are scheduled for the upcoming week. I’ve published a lot of training sequences and advice over the years. But now I have wonderful resources afforded by more modern technologies… and the internet. So, the training sequences are embellished with online YouTube recordings! We will observe a training method called a “break-down”. In the break-down format we practice the elements of a course. And once we believe we have those elements mastered, we will run the course! 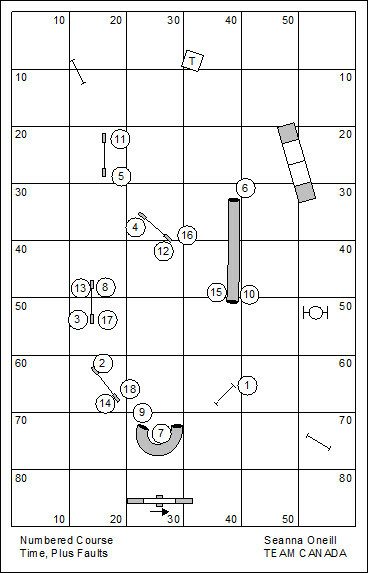 The Masters level course for the 60×90 floor space are intended to feature advanced challenges, with considerable flow, allowing interesting technical moments to come to the dog and handler at full speed. The simple objective of this exercise is to practice a tight wrapping turn at jump #2. This is a marvelous opportunity to experiment with a pre-cued turn, focusing on what any individual dog needs to give advice of an impending turn at a jump. The transition from the “wrap” at jump #1 around the front of the floor to the teeter isn’t featured as a practice sequence. Ideally the handler can direct the dog at a distance. Distance requires the dog to work independently, and might encourage the dog to work at full speed which, with any luck, is faster than a handler might be able to move. On this course it is somewhat desirable for the dog to perform the teeter at some distance from the handler. This allows the handler to take a control position for the approach to the weave poles. The approach to the weave poles isn’t a simple matter. The pipe tunnel looms as a wrong-course option. And, ultimately, the handler probably want dog on right for the weave pole performance. The handler who must shape the approach to the weave poles is especially challenged to set up that approach. In the ideal world, the handler would be able to give a cue to the weave poles, and trust the dog to go out and find that entry. After the performance of the weave poles there is again an opportunity to send the dog to and over the two jumps on the approach to the A-frame. There is a real possibility that the dog will draw in to the pipe tunnel after the performance of the weave poles and jump. The handler must keep pressure out after jump #9 to have prospects for success. This is not featured on our training videos. But it might be an independent exercise to be incorporated either with the weave poles or the approach to the A-frame. A discrimination might be solved by handling. The discrimination might also be solved by training. Imagine if we trained our dogs to understand which obstacle to be performed based on the command given on the approach. We want to understand both handling and training as we approach this exercise. After the A-frame, jump and tunnel the sequencing is fairly straight-forward. The dog take another two jumps out and around the pipe tunnel, and then is finally turned abruptly into that pipe tunnel. The finish of the course is jump and tire to finish! At some point we might be satisfied with the grind after titles and little cloth ribbons approach to our play of this game; and maybe we’ll be ready for the next step. Imagine dog agility that gives substantial cash rewards to the top performers. 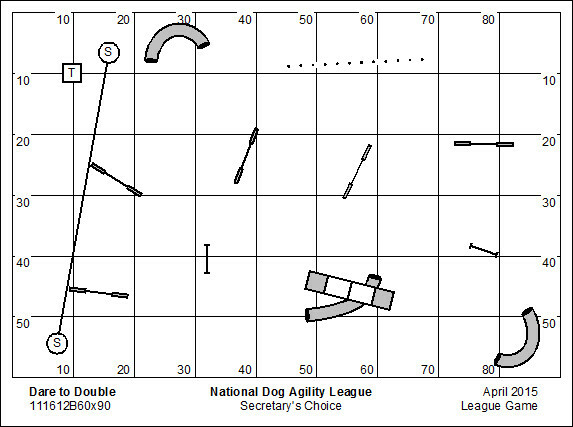 The National Dog Agility League is contemplating just such an approach to dog agility. The starting point is league play. We invite anyone who would like to play to join us. We have about 20 clubs in four different countries playing with us now. We believe in YouTube recording of our performances! It’s fun to see how other players in different parts of the world approach the solution to simple coursework. More information about semi-professional and professional dog agility will be revealed! Oh, it’s easy to join the NDAL. We have a $10 dog registration (which is kept by the host club)… and we charge a meager $1/dog recording fee. 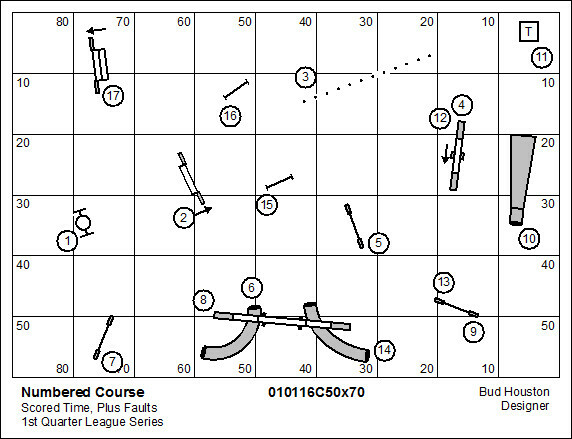 You are welcome to begin play with the 60×90 Masters course we have trained with here. Download the scorekeeping worksheet… and you become a member of the league when you post results! I originally wrote this post with outlinks to YouTube. Being a bit slow on the uptake, after getting a bit of feedback about how cumbersome it is to follow the conversation with multiple processes and windows open; I sat down with some Bing (Google) research on how to embed a link to a YouTube video. Consequently, I learned something important that will become my new method. And, I have taken the liberty to go back to this post and edit it for inline display of the link to YouTube. I may very well go back and edit about a hundred WordPress Posts to make this fix. You are currently browsing the archives for the National Dog Agility League category.